Without it, dreams of a cleaner, greener, more efficient world—including self-driving cars, the Internet of Things, and the data centers and artificial intelligence needed to run them—would crunch to a low-tech halt. Secure and reliable supply of fuels and power has always been essential for industry, public services, and domestic needs, but the global energy system is in a state of flux. Environmental concerns and how to fuel the technologies for the fourth industrial revolution are recurring themes in discussions about how the energy system will evolve. No single government, industry, company, or other institution can address the challenges facing the energy sector alone. According to the report, 43 countries boast well-performing energy systems and high-transition readiness, which indicates their ability to address the energy transition based on current performance. 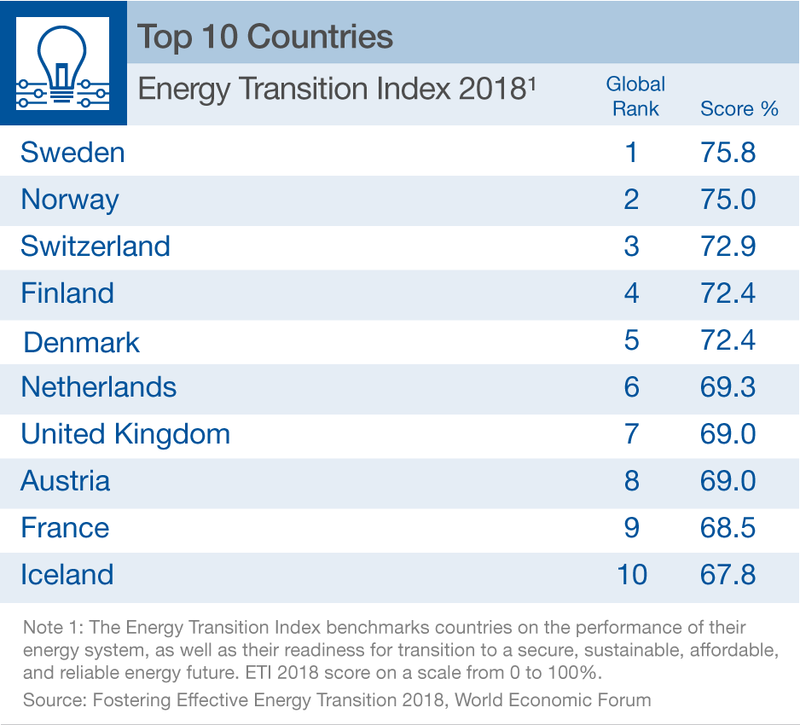 Most of the countries considered best prepared for the energy transition are European, with the likes of Denmark, Sweden, and Norway achieving high scores across most metrics. What’s more, these countries have also largely overcome the challenges posed by operating a high share of legacy energy infrastructure. “They could serve as examples to other countries when it comes to policy and regulatory frameworks, infrastructure, and business environments needed to incentivize consumer and business behavior change to manage environmental impact,” the report says.